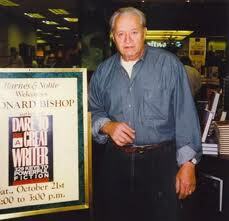 I used to shake my head at some of Leonard Bishop’s teachings. He’d harrangue us with writing advice. His voice would bellow with authority…insistent, commanding, and frightening! Frightening because he said it with such force, I figured whatever he said must be true. The only problem was, I couldn’t figure out what he meant. I needed more experiences and experimentation to understand. That always made me feel better! I think about him often as I am in the process of reworking an old piece. I pull out my list of favorite quotes and realize he is talking to me now, helping me to push myself to write better than I believe I can. One of the best lines he ever said was, “That was a very professional scene. Now that you know you can write well, you have no excuse to write poorly.” Dang. No slacking…ever! What I need to hear now….. This entry was posted in History, Inspiration, Writer's Hint, Writing, writing a novel, Writing Techniques and tagged American Novelist, characterization, Dare to Be A Great Writer, dramatic scenes, effective scenes, Leonard Bishop, teaching writing, writer's hints, writing inspiration, writing teacher. Bookmark the permalink.